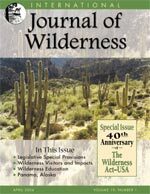 To expand your wilderness knowledge and target your action to protect wilderness, take advantage of the most extensive wilderness publications archive in the world, with free access to IJW issues that started in 1995! 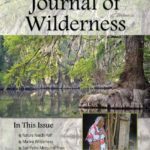 This December issue of the International Journal of Wilderness ends the 2011 year with a WILD10 update from The WILD Foundation's president, Vance Martin. We hear from Magnus Sylven, a member of the WILD10 Executive Committee, about Nature Needs Half- a new spatial perspective for a healthy planet. Other IJW contributors include Howard L. Smith, Cyril F. Kormos, M. Rupert Cutler, Neal Christensen, Brooke B. McBride, Tom Carlson, Lisa Eidson, Jaime Rojo and Gordon Cessford. 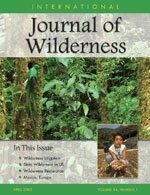 This issue of the International Journal of Wilderness includes two summaries of WILD9, the 9th World Wilderness Congress (November 2009 in Merida, Mexico). Vance Martin provides a general overview, historical context and practical accomplishments of the Congress and David Parsons provides a personal account of his experience. 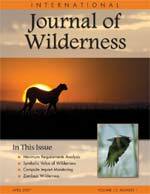 Other articles include a stewardship article by Hawk Rosales about the InterTribal Sinkyone Wilderness, a review of bear-resistant food storage canisters, a study of monitoring campsite conditions with digital image analysis and more. The August 2010 IJW features a wonderful, heartfelt letter from the late George Duffy. This “Farewell” essay was written to fellow wilderness stewards after George learned he had a rare and fatal cancer. The letter reflects how George lived his life: full of verve and passion for wilderness, and always striving to improve wilderness stewardship. Angeles Mendoza Sammet and Michael S. Quinn contribute a Science & Research paper on the governance challenges for wildland preservation in Canada and Mexico. 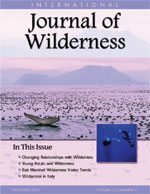 In the December 2010 issue of the International Journal of Wilderness, managing editor Chad P. Dawson announced the exciting transition to offering the Journal online. Till Meyer contributes a Stewardship paper on the exciting rewildling work in Germany, and Wade M. Vagias and Robert B. Powell contribute a Science and Research paper on backcountry visitors’ leave no trace attitudes. 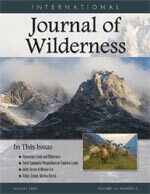 This issue of the International Journal of Wilderness puts some focus on mountain ranges, including the Carpathian Mountains and Adirondack Park. Climbers’ Attitudes toward Recreation Resource Impacts in the Adirondack Park’s Giant Mountain Wilderness (Christopher A. Monz) discusses research outcomes regarding climbers’ outlooks on the use and misuse of recreation resources. The Carpathian Mountains (Michael C. Baltzer, David Strobel, and Vlado Vancura) explores different aspects of the mountains, including threats, mammal population, and future possibilities. 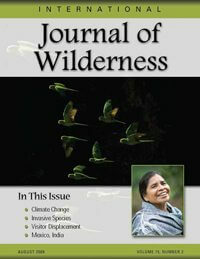 This issue of the IJW explores some interesting topics including climate change and biodiversity. The Nature of Climate Change (Locke and Mackey) explores issues related to climate change. Key Biodiversity Areas in Wilderness (Upgren, Bernard, Clay, de Silva, Foster, James, Kasecker, Knox, Rial, Roxburgh, Storey and Williams) discusses the importance of identifying biodiversity areas. 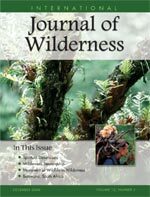 This issue of the International Journal of Wilderness touches on several different aspects associated with wilderness. New Wilderness Legislation in 2009 (Chad P. Dawson) discusses the importance of the Omnibus Public Land Management Act of 2009. Embracing Web 2.0 Technologies (Lisa Eidson) shows an interesting perspective on social networking, blogging and more. 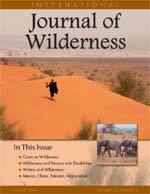 This issue of the IJW discusses wilderness litigation. The Need for Wilderness Litigation (Jon Dettmann) and U.S. Forest Service Litigation (Robert. W. Malmsheimer, Coraline Falco, Amanda M. Anderson, Denise M. Keele, and Donald W. Floyd) look into the importance of wilderness litigation and discuss research on USFS land management litigation based on the Wilderness Act and Wild and Scenic Rivers Act from 1989-2004. 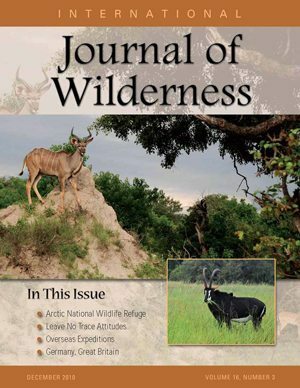 This issue of the Journal explores international wilderness, including Russia and Mexico. The Water Forest of Mexico City (Beatriz Padilla, Francisco J. Romero, Fernando Jaramillo Monroy, Flora Guerrero Goff and Raul Garcia Barrios) and Personal Reflections on the Fate of Wilderness Reserves in Russia (Kathleen Braden) delve into the topics of urban wilderness and threatened nature reserves in Russia. This issue of the IJW includes two articles focused on fire. Wilderness Fire Policy in the Southwest (David M. Ostergren and Megan L. Triplett) looks into the challenges regarding reintroducing fire into wilderness. Changing Research Needs in Wilderness Fire (Carol Miller) discusses fire management strategies researched at the Aldo Leopold Wilderness Research Institute. 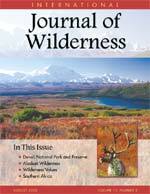 This issue of the International Journal of Wilderness put some focus on visitor usage of wilderness. Wilderness Day Use (J. Daniel Abbe and Robert E. Manning) and An Examination of Constraints to Wilderness Visitation (Gary T. Green, J.M. Bowker, Cassandra Y. Johnson, H. Ken Cordell and Xiongfei Wang) explore the impact from day use visitors as well as which social groups visit wilderness more and which groups feel as though they have more constraints. 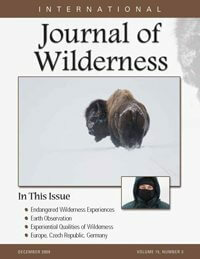 This issue of the Journal incorporates a couple of articles focused on technology and wilderness. GPS and the Internet (Joe Van Horn) and New Opportunities for Educating Future Wilderness and Wildland Managers in a Changing Technological World (Chad P. Dawson) look into how differently wilderness experiences are shared now with GPS mapping and internet capabilities, as well as how differently wilderness managers communicate and learn with changing technologies. 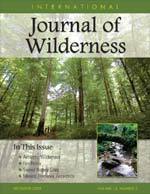 This issue of the Journal covers many aspects of wilderness and fire. From Amphibians and wildfire in the US Northeast (by Blake Hossack), to the evolution of wilderness fire policy (by Gregory Aplet), the contributions to this issue provide a wide-scope view of the use of fire in managing wilderness, how fire effects biodiversity, plant life and human visitation, and how the fire stewardship is used in Alaska, South Africa and elsewhere. 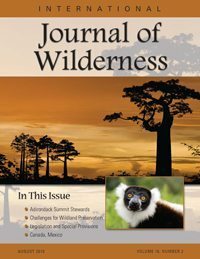 In this issue of the Journal, Patricio Robles Gil contributes an international perspective on the first wilderness designation in Latin America, El Carmen wilderness. George Schaller presents a proposal for a Pamir International Peace Park, principally in Tajikistan, Afghanistan and Pakistan. In the book reviews, John Shultis looks at “Transboundary Conservation: A New Vision for Protected Areas,” by Russell Mittermeier, Cyril Kormos, Cristina Mittermeier, et al. 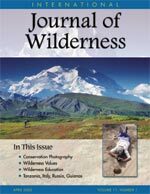 This issue of the Journal starts with an editorial perspective from Vance Martin on wilderness as a bipartisan cause, and announcing the International Conservation Caucus Foundation (ICCF). Joseph E. Mbaiwa and Onaletshepho I. Mbaiwa contribute an article on the effects of veterinary fences on wildlife population in the Okavango Delta region of Botswana. In this issue of the Journal, Cristina Mittermeier provides a call to action and mission for all conservation photographers. In her stewardship article, she announces the first ever Conservation Photography symposium, which convened at the 8th World Wilderness Congress in Anchorage, Alaska, 2005 and lead to the formation of the International League of Conservation Photographers. 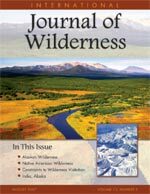 Gregory Brown and Lilian Alessa contribute an article on wilderness values in Alaska, based on GIS-based study methods. 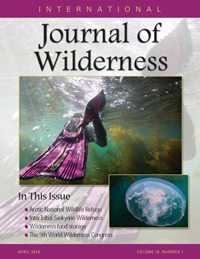 This issue of the journal focuses specifically on Alaska wilderness, in preparation for the 8th World Wilderness Congress, Anchorage, Alaska 1005. Miki Collins and Julie Collins write about the traditional way of life at Denali and how subsistence lifestyles can go hand-in-hand with protecting for wilderness values. Stephen F. McCool, winner of the Chief’s Excellence in Wilderness Stewardship Award, details his work in the Bob Marshal wilderness. 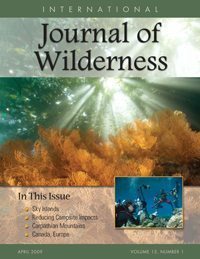 Two articles in this issue of the journal address natural disasters and the implications for wilderness areas, specifically focused on the impacts of the 2004 hurricanes that devastated many national forest lands in Florida. Russell Mittermeier, Frank Hawkins, Serge Rajaobelina and Oliver Landgrand contribute an article focused on the Biodiversity Hotspot of Madagascar and conservation efforts there. 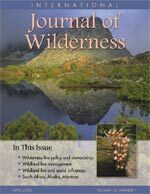 This issue of the IJW salutes forty years of the US Wilderness Act. John Hendee and Chad Dawson contribute a special editorial perspective on this significant milestone. In the education and communication section, Dawson and Hendee also provide an overview of wilderness-related courses at US Colleges and Universities and Suzanne Caswell and Rob Meltzer introduce the Wilderness Therapy Symposium Series at Naropa University. John Shultis reviews the book, “Wilderness: Earth’s Last Wild Places,” by Russell A. Mittermeier et al.